It hasn’t been the best year for whichever letter people may fall under when it comes to the LGBT community. Sure, there’s been more exposure to those who tell similar stories in the media and in real life. But with the Pulse nightclub shooting in Orlando, as well as the campaigns to have what little rights the LGBT community have stripped from them, it’s difficult to see the sunshine through all of the stormy clouds. 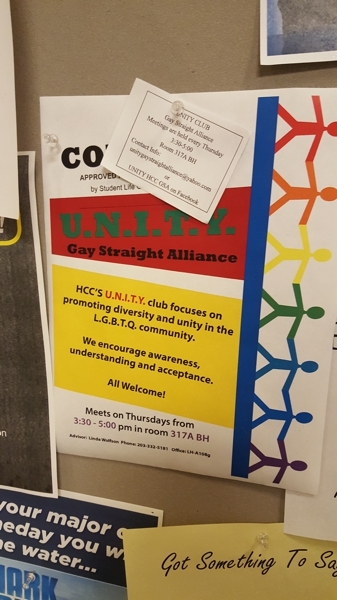 HCC’s Unity Club could be the silver lining to it all. 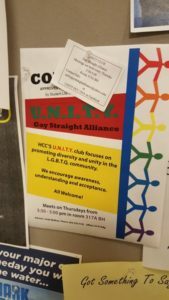 Led by President and HCC student Brandon Ortiz, Unity offers a club that doubles as a safe space for those in need of friendship and support. He joined the club after his first year of skipping clubs to focus on his academics, but was curious about club as it was a topic he was familiar with. Unity Club is a space that is “very open” when it comes to its members and those who wish to join. “If we need to be a safe space for anyone who wants to come in and talk about whatever they are dealing with,” Ortiz said. “Or if they’re not open to their families, they can be open to us and nothing leaves the room.” He wants to spread awareness to the public and also mentioned that the club is also fun from time to time, and not the sad and serious club they often get the rap of. Many times, when straight people hear the term “LGBT,” they are hesitant to engage and interact with the community. But the club has open arms for those who wish to learn about gays, lesbians, and everyone in between. Unity offers a safe space for all who wish to join. Photo by Martin Fenicien. Ortiz also mentioned how this is a subject that crosses borders, genders, race, and political party. It’s something that is within our community and homes and it needs to be discussed as it is relevant and prominent in this day in age. The club also has plans during the spring semester to head to True Colors, a conference held every year at the UCONN campus in Storrs. It happens to be the largest LGBT youth conference in the country, filled with guest speakers, performers, and workshops for those who want to learn more about the community. Ortiz urges those who are interested to join to make small changes in their world when it comes to LGBT rights, whether it’s simply listening to someone who needs it or just speaking up on injustices and issues in society. Any support is good support. “Good intentions can only go so far. If you really want to make a change, you have to be open about it and have some kind of bravery,” he said. Meetings are held every Thursday from 3:30 to 5:30 p.m. in the Student Life Office in Beacon Hall.